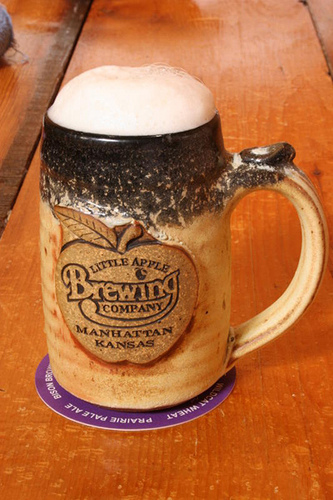 Little Apple Brewing Company opened in 1995 as a partnership between Galen and Lori Fink, who are Certified Angus Beef cattle genetics suppliers, and Russ and Kelly Loub. Russ has been a lifelong restaurateur who felt that Manhattan needed a micro-brewery – and that great food and great beer would be a natural fit. Our menu boasts more than 60 items, plus a dozen nightly dinner specials that even the most demanding food connoisseur can appreciate. Our five flagship ales are Wildcat Wheat, Prairie Pale, Riley’s Red, Bison Brown and a Black Angus Stout. Our beer is served in growlers or in kegs, and we distribute it through Handcrafted Wines of Kansas. The combination of our great food and great beer. All of our beef is Certified Angus Beef, and all of our food is made from scratch with the finest ingredients. And our beer is unfiltered, which gives it a better texture and taste. 3) What is the one “must try” beer? By far the most popular beer with our regulars is the Prairie Pale Ale. For those new to micro-brewed beer, it would be the Wildcat Wheat. On Mad Cow Monday all pints are $2.50, and on Tuesday we offer growler refills at $6 – a $2 savings. This month we’ll celebrate St. Patrick’s Day with the tapping-of-the-keg ceremony, and on March 28 we’ll feature “The Food and Wine of Italy” with Jeremy Lamb, guest sommelier from Bluestem restaurant in Kansas City.For more information, visit www.littleapplebrewery.com. Tallgrass Brewing Company was founded in 2007 by Jeff and Tricia Gill. Although Jeff was trained as a geologist, he developed a passion for brewing after six years as a home brewer. 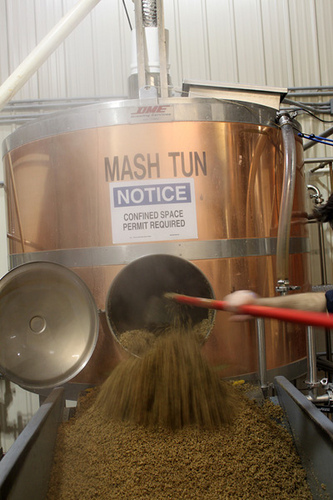 The Gills built the brewery in the Manhattan area because of its central location, the scenic Flint Hills and the city’s high-quality water – one of the most important factors in the brewing process. We currently brew five beers: Tallgrass Ale, Tallgrass IPA, Oasis, Buffalo Sweat and the new summer seasonal, Halcyon Unfiltered Wheat. Halcyon is brewed using Kansas wheat and has a unique fruity aroma and a taste like the very best day of summer. 2) Please explain your fermenting and bottling process. Last May we stopped bottling beer and switched exclusively to cans for our retail packaging. Cans keep beer fresher longer, are more versatile and are better for the environment. Tallgrass was on the forefront of the craft beer industry, which is seeing more breweries make the transition to cans. Although that’s like asking parents who their favorite child is, we can say that our Buffalo Sweat Stout and Oasis have a very loyal following. Unlike a brew pub, we do not control pricing and specials. The majority of our beers are sold on tap at more than 1,000 bars and restaurants and in cans at retail liquor stores in Kansas, Nebraska, Colorado, Okalahoma, Virginia, Mississippi, Minnesota and Missouri. Tallgrass sponsors concerts, bike rides, beer-fests and many other events throughout the Midwest.For more details, go to www.tallgrassbeer.com.